Graduate student presenters at the Nashville meeting may submit their revised conference paper to the Edward H. Moseley Student Paper Award competition. The deadline to submit to the committee is Wednesday, March 21, 2018 by 5pm EST. Submissions must not be longer than 25 pages, including bibliography, endnotes and/or footnotes. The Executive Committee of SECOLAS grants the three finalists the Richmond Brown Award for Graduate Student Scholarship. This small award will cover your annual membership dues, registration fees, and banquet ticket for SECOLAS’ annual meeting in Oaxaca, Mexico in spring 2019, during which the winner of the Moseley Award will be announced. SECOLAS is unable to offer travel grants. In the inaugural edition of Historias – the SECOLAS podcast, Steven Hyland sits down with Jürgen Buchenau and Gregory Crider, co-editors of the Annals edition of The Latin Americanist, to discuss their experiences with Southeastern Council of Latin American Studies and the organization’s importance for graduate students and professionals. PS – We are working our way through some technical difficulties, and as such this is a re-post. We appreciate your patience. Official program is now live! 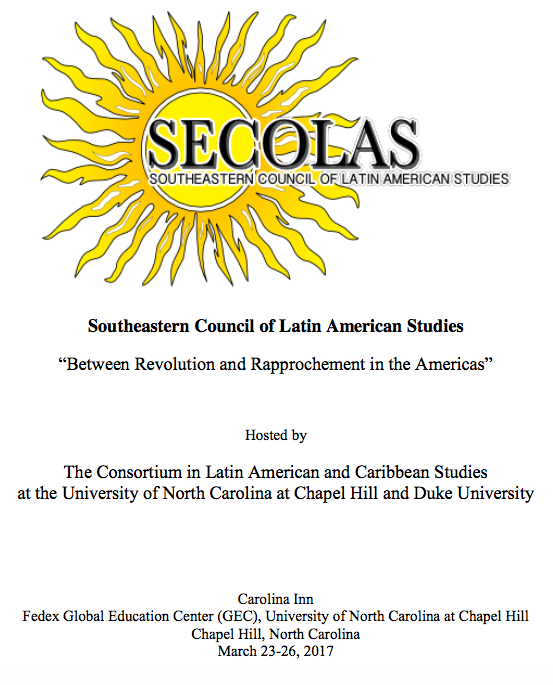 The 65th annual meeting of the Southeastern Council of Latin American Studies begins in one week! You may access the official program via this hyperlink. The Executive Committee of the Southeastern Council of Latin American Studies (SECOLAS) has issued a call for bids to sponsor its peer-reviewed journal The Latin Americanist (TLA). Bids should be presented in writing, with the signature of an administrative officer authorized to approve the disbursement of institutional funds. The bid to host The Latin Americanist should include a subvention equal to at least $10,000 per year ($50,000 total) to defray the costs of editing TLA. This subvention may take the form of released time, administrative assistance, travel support, and/or graduate student wages or stipends. The bid should also identify the names of the prospective editor of TLA as well as of the SECOLAS Annals (a special issue of TLA). This term begins on January 1, 2019 and concludes December 31, 2023. SECOLAS will end its publishing agreement with Wiley effective December 31, 2018. The Executive Committee is currently fielding proposals from potential publishers and intends to arrive at a decision at its 2018 meeting in March. Interested parties should submit its bid rendered in a .pdf file to Steven Hyland, Secretary-Treasurer of SECOLAS (s.hyland@wingate.edu), via email no later Thursday, February 22, 2018, 5pm EST. For additional information, contact Steven Hyland. Check out two of our annual awards given out to SECOLAS members in recognition of their scholarship, namely the Alfred B. Thomas Book Award and the Sturgis Leavitt Award for Best Article. 1. Do I have to be a member of SECOLAS to submit? Yes. You must be a member in good standing in the year the award is given (2018). In addition, for the Thomas Book award, you must have been a SECOLAS member for the previous two calendar years (2016 and 2017). For the Leavitt Award, you must have been a member in the year your article or book chapter was published (2017). 2. Do I need to attend the annual meeting to receive the award? No, but you will be sorely missed. Thomas Book Award – have the publisher get a copy of your book to each member of the committee by Friday, January 12, 2018. Sturgis Leavitt Award – send a pdf copy of your 2017 publication to each member of the committee by Friday, January 12, 2018. SECOLAS 2018 – abstract deadline extended to November 15! 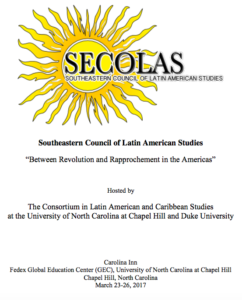 Based on several requests, SECOLAS has extended its deadline to submit your abstract for an individual paper or panel for SECOLAS 2018, hosted by the Center for Latin American Studies at Vanderbilt University from March 8-11, 2018. You may submit your individual or panel proposal by clicking this link. For further information, see the conference page, or follow us on twitter or on Facebook. To submit your abstract proposal, click through to the online submission form. Be sure to check out for updated information on the conference’s dedicated web page. ¡Ya empezamos! SECOLAS 2017 kicks off today! Be sure to check out the workshop on digital tools at 2pm in Room 3009, GEC and a round table discussion on the challenges and opportunities of global studies to Latin American studies at 3pm in Room 4003, GEC. Many thanks to the UNC-Duke Consortium in Latin American & Caribbean Studies Outreach Program for hosting and especially to UNC Institute for the Study of the Americas for letting us use their space as a base camp. Here is a digital copy of the official program. Do not fret if you missed the initial deadline to submit an abstract for SECOLAS 2017 in Chapel Hill, NC. You may do so until December 1, 2016. For further information regarding the submission process, visit our dedicated conference page.